We have two new rivals to the monitor, which were changed from “IN PROGRESS” to “PAYING” in these days. Unfortunately, one of them turned into a scam yesterday. I would say one of the quickest scams lately. Today I will review a program called MeguroStar, which joined Sticky Listing on DavidNews.com monitor on the 8th of February. It has been online in total for 10 days. MeguroStar is another program with blockchain madness backed legend, but with a simple but visually appealing website. Now I have reinvested in this program $360 and will keep you updated about the payment status on the monitor page. Keep reading to find out more about MeguroStar and its main characteristics. Those in a hurry and looking forward to hearing some brief intro about investment plans will not be satisfied to hear that they can’t be described in one paragraph. In fact, it took me a while to understand where I should make the reinvestment. Why? Because you need to choose between higher interest mid-term plans and lower-interest short-term plans. Admin is already pointing out which plan is there to attract the most investors – “Beginner Plan” with 7% net profit after 7 days (no withdrawals before the end of term) and a minimum deposit of $10. All other plans have one thing in common - withdrawals are available during the investment term and the initial deposit is included in the interest rate. Withdrawal payment intervals for this category of plans on MeguroStar vary from every day to every 7 days while overall net profit may change from 20% to 140%. Keep in mind that these plans have also different terms – from 15 to 60 days. Therefore, it’s important to do your own calculations to understand what’s the most beneficial plan. If we divide the overall profit % with the number of days of each plan of the plans with deposit included in payments, we get the following daily rates – 1.3%, 1.7%, 2% and 2.3%. Still interested to find out more about MeguroStar and its plans? Keep reading. Even though I like the design of MeguroStar website a lot I must admit the admin could have done way better with the legend. It just one of those generic cryptocurrency legends where you have a feeling it can be used for any other program and most likely this program will not be remembered after a while. Main terms of MeguroStar legend are as follows – Blockchain technology, crypto-exchange, trade, hedge-funds, algorithms. Feel free to check out the “About Us” page in case you are eager to find out more about the program. However, we all know that legends can help programs to be remembered but have no impact on the payment status once admin decides to stop it or the cash is no longer circulating in the program. The website is built using a licensed H-Script – script for HYIP’s, which is one of the most common HYIP scripts among others like Gold Coders etc. Using a script for a website doesn’t mean it has to be copied design. In fact, I don’t recall a program with a similar design to MeguroStar. SSL certificate assigned by Comodo is valid until the December 2018. Unfortunately, it lacks responsive design, which would make it even better if compared to many other HYIP websites. Sure, it wouldn’t stop a potential investor and is only a matter of user experience. Luckily admin has decided to integrate an investment plan calculator on the website. Lately, I have noticed several websites lacking this function, which I find useful. Admin of MeguroStar has chosen the approach of one website language, which is English. However, the server time shows Moscow time. You can find it in the footer of the website. Unfortunately, the website hasn’t been online long enough for Alexa rank to collect data about visitor countries. Still, it shows some stats about main traffic countries – Russia, Ukraine, Belarus, and Kazakhstan. So, use of H-Script, which is more common among Russian speaking audience, server time and Alexa rank – it all indicates that program most likely is led by people from a certain region. MeguroStar so far has been more active on Twitter with 147 tweets, 25 followers, and 161 likes. I guess it was achieved regularly retweeting content related to crypto-currencies from other profiles. The Facebook profile has only 20 likes and 2 posts. In case you have any questions to ask admins – use FB, Twitter, Google+, Contact form or e-mail. I would like to add that forum discussions didn’t point a light at any interesting facts about this program. Just usual chatter and subjective opinions about investment plans. Let’s dig a bit deeper into investment plan details. Minimum withdrawal is 0.01$, there are no extra fees and they are processed instantly. I’m uncertain about the payment options. From the website footer and investor panel, I understand that there are 6 payment options. On the FAQ page, there is only one payment option – PerfectMoney. Moreover, on the news feed, there is information that AdvCash was added only on the 13th of February. However, in the personal cabinet, I can see also a list of all 6 payment options. I did use PerfectMoney for the reinvestment and can’t really comment on this. It’s quite confusing and I would kindly ask you to drop a message in the chat box in case you already have invested using any other payment option except PerfectMoney. 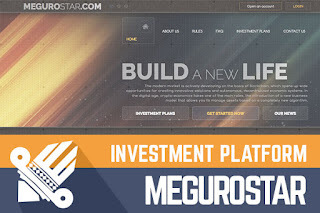 I already mentioned that there is a dilemma about MeguroStar investment plans – go for more frequent withdrawals or higher overall net profit. Let’s begin and try to understand the daily net profit of each plan. “Beginner plan” for 7 days – 1% net profit daily, “Advanced plan” for 15 days - 1.33% daily, “Professional plan” for 30 days – 1.67% daily, “MGP Active” for 45 days – 1.98% daily and “MGP Active Max” for 60 days 2.33%. Sure, the longer term – the higher daily net profit. I did find myself a golden middle – more regular withdrawals and average total term and chose plan called “Professional Plan”. For example, 200$ investment in this plan would reach the break-even point after 20 days. After 21 days because withdrawals are every 3 days. Last 10 days investment would be making a profit in case this program will reach the break-even point. However, I believe that most popular plan will be “Beginner plan” which has a minimum deposit of $10 and maximum $100. For example, $100 investment would make a net profit of $7 at the end of the term. The downside of this plan – in case it collapses over 7-day term investor can lose everything. We are looking here at a comparably new program with short and mid-term investment plans with net interest rate varying from 1 to 2.33%. Even though the program looks fine I think that the downside of these plans is intervals between withdrawals. Anything could happen between every day withdrawals and even more between 3-day withdrawals. Remember that all HYIP’s are unpredictable and no program can guarantee the safety of your investment. Therefore, if you ever decide to make any investments, don’t invest more than you can afford to lose! Have you already made an investment in MeguroStar and have any useful information to share with us? Please drop a message in the chat box to share your experience! Investment plans: 107% after 7 days, 40% every 5 days for 15 days, 15% every 3 days for 30 days, 4.2% every day for 45 days, 24% every 6 days for 60 days. Initial deposit included in the payments. Join 1,000,000's who have already found easier methods for investing in Ethereum.